MAINE RIVERS WHITEWATER RAFTING ! Yes we have Extreme Rapids here in Maine !! But we also have Less Extreme Water for FAMILY FUN TRIPS !! Most all companys here offer GREAT Packages , including accomodations & meals .also many include , Climbing , Eco trips , Moosewatching , Safaris , Snowmobling , ATV trips & Rentals , Kayaking & Canoeing ,Camping , Hiking, Biking ,& Family Packages. AWESOME!! CHECK IT OUT & TELL THEM Adventure Maine SENT YOU !!! SCROLL DOWN PAGE FOR FEATURED RAFTING !! Wilderness Expeditions has all the rafting trips in Maine that you could imagine, ranging from the tame family trips to wild adventures. We offer daily raft trips on the Penobscot and Kennebec Rivers with 8-man rafts. Dead River rafting is available on scheduled large release dates. Wildside 6-man rafts are also available for bigger thrills on the Kennebec, Penobscot and Dead Rivers. We offer ducky trips in inflatable kayaks on the Seboomook section of the Penobscot River, Lower Kennebec River & East Branch Kennebec Rivers. Maine White Water Rafting Adventures Crab Apple Whitewater is a family business opened in 1983 - we are the largest whitewater rafting outfitter in New England with trips at our home base in Maine and also in Massachusetts and Vermont. On all of our adventures, Crab Apple focuses on service with a personal touch. Family members run and are involved with every trip on the Kennebec and Dead Rivers giving our trips a special degree of comfort and satisfaction to our guests. Rafting trips are highlighted by excellent guides, superior equipment and great food. Photos and video are shot on all trips and shown after a run down the rapids. Conveniently located on the river, we are the only outfitter with an on-premise take-out after your Kennbec trip - that means no long, cold and soggy bus rides after rafting! Amenities at our base make for a comfortable adventure or mulit-day stay. Our main base includes a great pub, dining room, gift shop and conference room. Surrounding the base lodge outside are our heated pool, hot tub and sand volleyball court. Lodging units range from bunk style accommodations to homey cabins and elegant suites. Campsites sit right along the Kennebec River. After rafting consider one of our other activities - a hike to Maine's highest waterfall - Moxie Falls, a Moose and Wildlife Safari, an inflatable kayak "Funyak" trip or a few hours of Paintball on our fantastic, custom fields at Rapidshot Paintball. We accommodate all group sizes from families to large youth organizations. Group rates are available for parties over 16. Perfect for scouts, schools, bachelor/bachelorette, corporate outings. Call for more info and reservations 1-800-553-RAFT(7238) or check out what our family business is all about at www.crabapplewhitewater.com. Fill out the Trip Planner page and our great office staff will help you reserve a memorable adventure with Crab Apple Whitewater Rafting. Maine is fortunate to have a variety of rivers to meet the interest of a wide variety of paddlers. All Rivers are rated on a class scale ranging from Class I the easiest to Class VI the most challenging. The descriptions below will help you choose the best adventure for you and your family. Regardless of your choice, your safety is our top priority and Northwoods Outfitters has one of the best safety records in the industry. The Kennebec river rafting trip is by far our most popular trip. The rapids up to a class V with most of the river classified below that.Looking for a fun wild ride, the Penobscot is one of the best! The Penobscot is a train of exiting rapids rushing through boulders, drops and holes. Because of the technical nature of the river we do require that all participants be at least 18 years of age. fish and all the fixings. We work with the top adventure vacation outfitters and white water rafting companies in the local area so you can have proper cabin rental accommodations and meals for ANY Maine adventure vacation you desire. You may contact us by phone or use our registration page to arrange a Maine white water rafting trip - or any other trip for that matter. 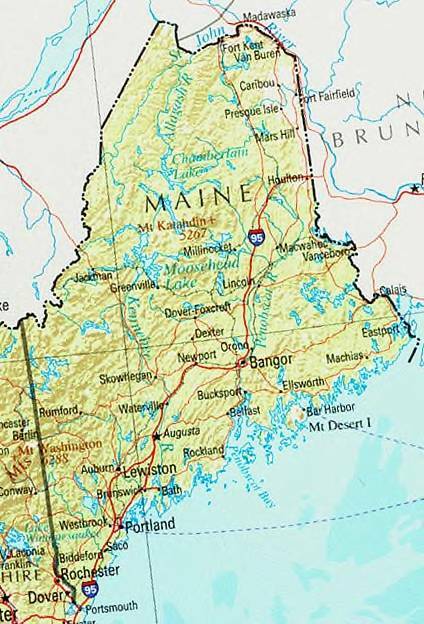 We are located extremely close to the Dead River, Kennebec River and The Penobscot River. Whether you are an experienced rafter or new to the fun, the Kennebec River is sure to be a great day of rafting. This Class IV river is New England’s most popular white water rafting trip. Try the Penobscot River, the most challenging Whitewater Rafting River in the East with Class IV and V rapids. The amazing Dead River has more limited release dates - so call us for more information. Try a 2-day rafting package and get to raft two different rivers. MAINE WHITEWATER RAFTING FEATURED ! !